300 9x12 PSBM Brand 2 Mil Poly Mailers Self Seal Plastic Bags Envelopes. Get Supersized Images & Free Image Hosting. Create your brand with Auctiva's. Attention Sellers - Get Templates Image Hosting, Scheduling at Auctiva. 10000 Pcs Reclosable Bags W/ Slider Block 2 Mil Thick Plastic Poly Bags 5" x 8". These 2 mil Reclosable Slider bags are great for applications where quick, positive closure and ease of use are important. Ideal for use with gloved hands. Slider helps hold bag open for one hand loading. Made of 100% virgin Low Density Polyethylene (LDPE) resin that meets FDA/USDA specifications. 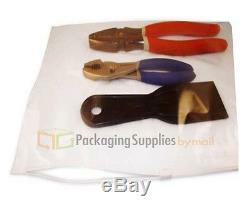 Reclosable Slider Bags are Available in different sizes. High Quality 2.0 Mil Reclosable Bags. Don't Get Stuck With the Cheap Ones! Use For Variety of Purpose. Slider Reclosable Bags Meets FDA and USDA Food Specification. Content is Visible Through This Clear Low Density Polyethyiene Bags. Slider Reclosable Bags are available in different sizes. If you are not happy with the quality of the product, you may return it within. Place your orders today to try our quality products and excellent service!!!! The item "10000 Pcs Reclosable Bags With Slider Block 2 Mil Thick Plastic Poly Bags 5 x 8" is in sale since Tuesday, September 19, 2017. This item is in the category "Business & Industrial\Material Handling\Packaging & Shipping\Packing & Shipping Bags\Reclosable & Zipper Bags". The seller is "packagingsuppliesbymail" and is located in Solon, Ohio. This item can be shipped to United States, Canada, United Kingdom, Denmark, Romania, Slovakia, Bulgaria, Czech republic, Finland, Hungary, Latvia, Lithuania, Malta, Estonia, Australia, Greece, Portugal, Cyprus, Slovenia, Japan, China, Sweden, South Korea, Indonesia, Taiwan, South africa, Thailand, Belgium, France, Hong Kong, Ireland, Netherlands, Poland, Spain, Italy, Germany, Austria, Israel, Mexico, New Zealand, Philippines, Singapore, Switzerland, Norway, Saudi arabia, Ukraine, United arab emirates, Qatar, Kuwait, Bahrain, Croatia, Malaysia, Brazil, Chile, Colombia, Costa rica, Panama, Trinidad and tobago, Guatemala, Honduras, Jamaica.